This is a recipe handed down from mother, who would make it for every holiday dinner, and it was always a favorite. Therefore, we asked her for it several years ago, she recited it to the dear wife; and then she detailed it onto a note card, and now makes it often in our home. What makes this a quick to fix dessert is the use of a typical box of brownie mix, one that will yield a batch in a 9×9 or 8×8 pan. Of course, a from scratch brownie recipe would do just as well, so please feel free to use your own if you so desire. Please note that this recipe and the name has nothing to do with illicit drugs, or anything with cooking with drugs. 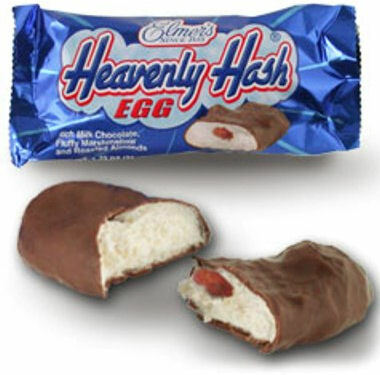 The name is derived from the Elmer’s Candy Company famous Easter candy aptly named Heavenly Hash Egg, please refer to this nice review of the famous Easter candy egg. It is one of our favorites, however, typically only sold in the New Orleans area. 1. 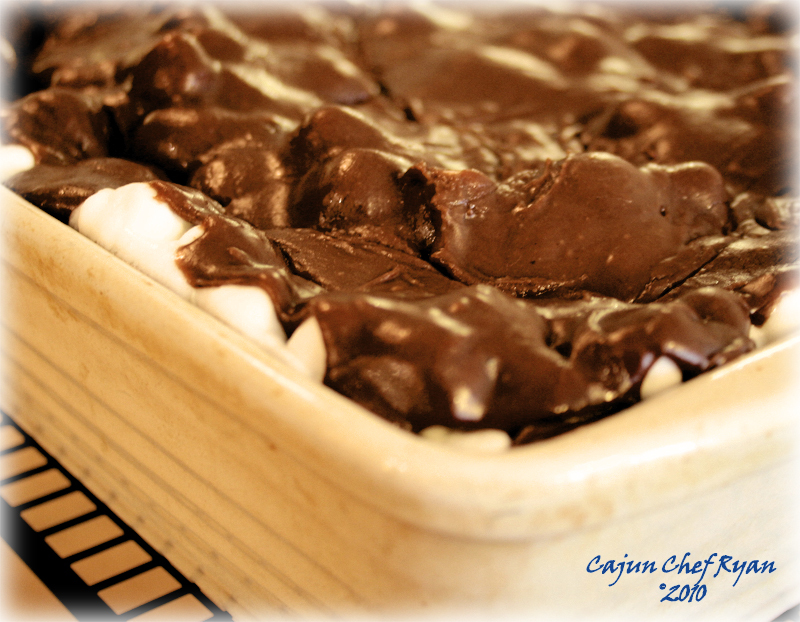 Prepare the brownie mix per the package directions, with the addition of the chopped nuts in an 8×8 or 9×9 pan. 2. When fully baked, remove from oven and top with the marshmallows, allowing them to melt slightly. 3. In the melted butter, add the baking chocolate, and milk, and allow to melt over a very low heat. 4. Transfer the butter chocolate mixture to a large bowl then whisk in the confectioners sugar creating a chocolate icing. 5. Pour the icing over the top of the marshmallows and allow to set up before cutting. 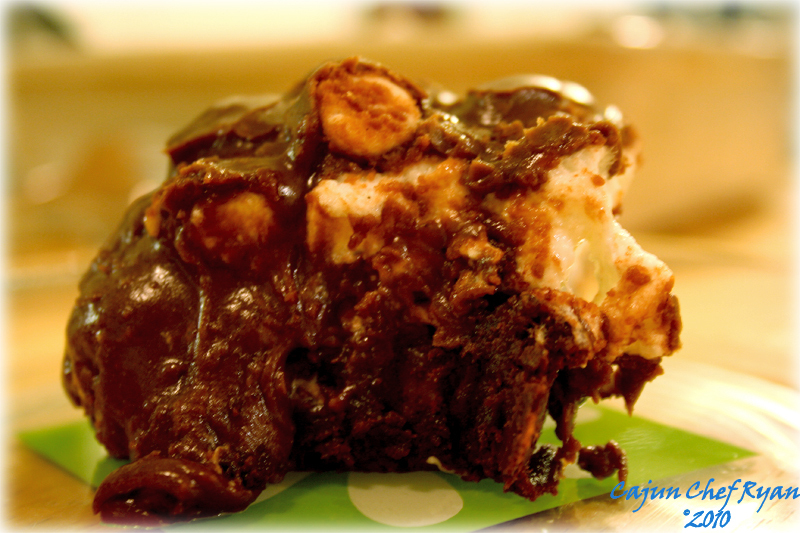 I love that layer of gooey marshmallow and chocoloate on top! This is just irresistible. Sounds like a nice messy, gooey treat, my favorite! This looks like trouble! I don’t know if I could stop after one! This looks very googy and yummy. Reminds me a bit of the yummy bars my family made. Maybe one day I’ll share that recipe. Love these brownies – heck anything that combines chocolate and marshmallows has to be great – and these sure look awesome! These are heavenly Chef. I bet they’re super moist and gooey. My kind of brownie. The title made me come. the ooey, gooey, melty chocolate made me stay.Now must hide this from the family or else this will be all I am allowed to make! Impossible to have a small bite with those brownies….Adore them!! One word – YUMMY! Almost looks like a smore brownie. Great job! Evening folks, thanks so much for the wonderful comments and responses! Wow do those ever look decadent! A delicious way to use up the mini marshmallows I alsways seem to have! Wonderful recipe! Oh my gosh Ryan my son would so love these brownies. He’s gone off to study in London so I guess when I make a pan I’ll be eating them alone! Oh my gosh, that last picture was absolutely the most decadent thing I’ve seen. Wow, I’m glad my family hasn’t seen this (or I’d be out hunting down brownie mix right now). Oh MY! I thought Ive fixed my chocolate cravings with chocolate pizza. Seems like I need this as well! Quite deserving of the “heavenly” title, methinks! Hey Doc, this is a “Drug Free” zone! Chef! 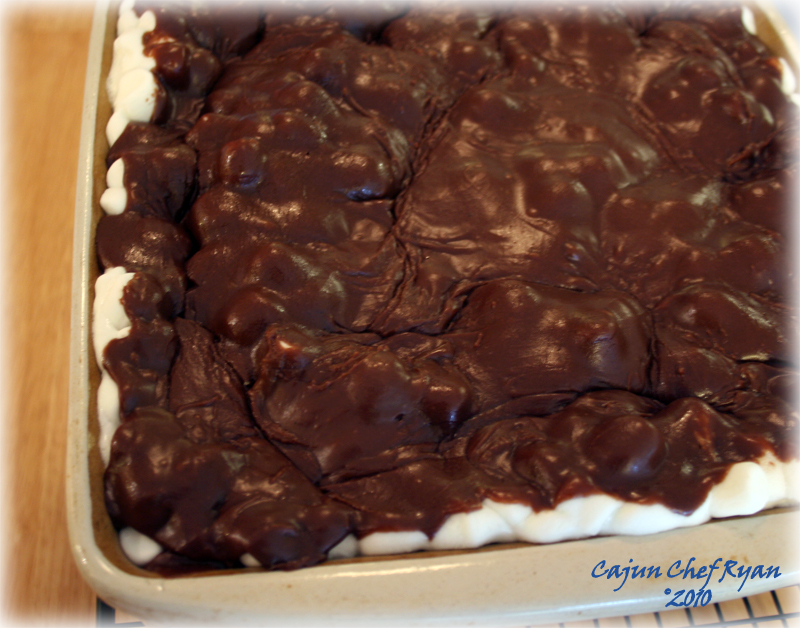 I can’t believe I missed this post (great minds must think alike), but here I was in my home just yesterday afternoon making what looks a lot like your heavenly hash–only mine is known as: Mississippi Mud! I bet they are related somehow from the “way back when” days! Nevertheless, your version looks waaaay good–piled high with the marshmallow! Yum! As a huge chocolate fan all I can say is wow. I could eat this for breakfast. Love it. 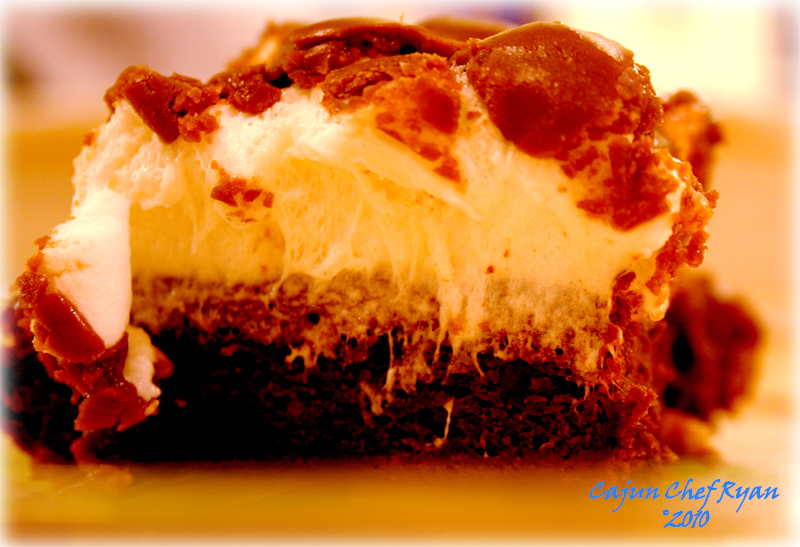 Hey Kelly, I just did see your Mississippi Mud cake, I would imagine that using a cake recipe in place of the brownie would change this one up to a Heavenly Hash Cake as well.